(Newser) – A soybean-laden US cargo shipped that was cheered on as it sped from Seattle to Dalian, China, in hopes of arriving before a 25% tariff went into effect on July 6 didn't just not make it. The Peak Pegasus spent a month sailing in circles while still carrying its 70,000 tons of soybeans in hopes the tariff would be reversed and it could hold off unloading its cargo until then. The Guardian did the math and found that it was perhaps a sensible move: Unburdening itself in China would, under the new tariffs, cost it an additional $6 million or so. The beans belong to the Amsterdam-based company Louis Dreyfus, which is thought to be paying the ship's owner, JP Morgan Asset Management, $12,500 per additional day it's chartered. 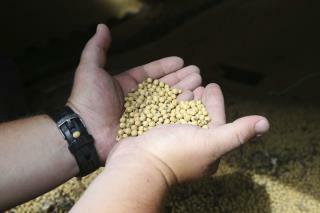 How stable are soybeans? I know they may stay in storage for a while but you add up the US land storage, ship storage time at sea, off load time at dock and China's storage before use it may be some stinky fermented stuff. The math worked out? No, you spent an extra 400K hoping America would fold to Chinese demands. We will not in spite of many lefties rooting for China. MAGA , lets drink more soybean milk!